Emeryville photographer joSon draws on his time as a Buddhist monk in Vietnam to create intimate portraits of nature. An image from joSon Intimate Portrait of Nature. When joSon sees beautiful flowers in the backyards of his neighbors, he'll knock on their doors, clippers in hand, and politely ask if he can snip the plants and take them home. "Most of the time people say yes," said the Emeryville-based photographer, who goes by the single name of joSon. "I just can't control myself," he said, calling his love of flowers an "addiction." 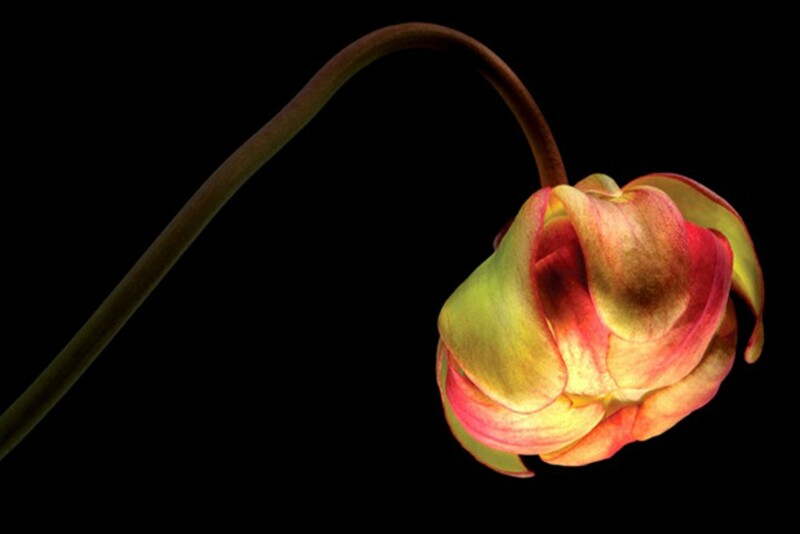 At quick glance, it would seem that his latest project, a breathtaking 208-page collection of flower photography, is a simple manifestation of this obsession. But, as joSon said, "This book is not about flowers." joSon Intimate Portrait of Nature — which features hundreds of striking, up-close images of flowers against black-and-white backdrops — "is about memories," he said. And it's not meant for a quick glance. Though the artist is now a busy and successful commercial photographer, the book, eight years in the making, reflects his deeply meditative and contemplative nature — a quality he traces to his unique upbringing as a Buddhist monk in a Vietnamese temple. At age ten, joSon, who was born in the Philippines and is half-Filipino and half-black, told his mother he did not want to be Catholic anymore. "So I moved to Vietnam to live in the temple. I thought my life was to become a monk. That was my only intention." He lived and studied at a temple called Long Son Pagoda on the south central coast of Vietnam. Given his multiethnic background, he often felt ostracized as a young child in the Philippines — which made the accepting environment of the temple all the more important to him. "The temple is a safe place for me," joSon said. "I find peace and tranquility within the walls of the temple. There is no judgment of the color of my skin or the texture of my hair." At age eighteen, however, joSon's masters told him that he had a different path set out for him: It was time for him to leave. "I was crushed," said joSon, now 41. "I was really hurt." This is, however, not an uncommon outcome for many young monks: "In Buddhist philosophy, you don't choose your own path. Life will choose the right path for you," he said. "I needed to leave the temple, because monkhood is not for me." joSon returned to the Philippines and went back to school, where he started taking photography classes. He eventually moved to Lake Tahoe, which had the "beautiful scenery and peacefulness" he was longing for, before relocating to San Francisco and then New York City. He ultimately settled down in Emeryville, where he now works and lives. Although he is no longer a practicing Buddhist monk, as he explained it, "Just because you leave the temple doesn't mean that you've left Buddhism. Because the temple is always inside you. It's your home. It's your foundation no matter where you go. No one can take that away. ... It becomes a part of you." Prior to taking those first photo courses after leaving the temple, joSon said he had never really thought of photography as an art form. "Cameras were a tool for documentation," he said. "And I didn't even really know what art is." He did, however, have an appreciation for nature, which is still evident in his intense fascination with the world around him. At lunch at a restaurant down the street from his Emeryville studio on San Pablo Avenue, he was immediately distracted by a floral scent in the air, the origin of which he tried to decipher for several minutes. "Life is challenging. We don't have time to look at beautiful things," he said, noting that it is important to find moments to observe and reflect. "Everything around us has a connection to our lives. Nothing is an accident." joSon, like many professionals in the Bay Area, however, often doesn't have a ton of free time to sit back and smell the roses. For his commercial work, he is constantly communicating with clients and working with ad agencies across the country; his photos, often portraits, appear in the marketing materials of such high-profile companies as Samsung, Target, and Yahoo. These obligations, and the many technological distractions available today, can make it difficult to find peace, he said. "TV, iPads — it's just temporary," he continued. "The world around us is full of beauty." He said he often ponders why nature is ultimately so important to humans: "Why do we have such an emotional connection with flowers?" That is, in a way, a central question he explores through Intimate Portrait, which was published in June. "If the flower is just an innocent plant, why do they have the power to bring so much of love, joy, solace and memory into our lives?" he writes in the book's short introduction. "Perhaps then what I'm showing here is not so much the portraits of flowers but portraits of our own souls — because through them we learn more about ourselves, our own emotions, and how we meld and melt into the world around us." 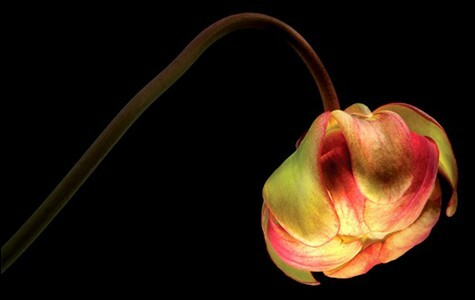 Abstract philosophy aside, joSon's work presents stunning images of flowers — portraits that contain the kind of exquisite detail that is rarely seen in floral photography, said Frank Almeda, senior curator of botany at the California Academy of Sciences, who helped joSon properly identify the plants in the book. "It's like a pair of binoculars. It opens windows for people to see something they may not have seen before. He creates this great portrait of beauty that people will really look at and really dwell on." In fact, an oft-discussed problem in the field of botany is that there are so many living species that have not been adequately photographed, Almeda said. Some of joSon's subjects are exotic flowers that botanical experts and plant lovers from all over the world have sent to him, while others are flowers he picked here in the East Bay. In total, there are more than one hundred different species represented in the book. "He even brings beauty to things that are often considered really common," said Almeda, pointing to a full-page spread of a cymbidium orchid. "You've seen hundreds of these before ... but you've never seen it in the way he's captured it there." Paul Lee Cannon, who provided horticultural research for the book, added, "You can't get any closer to a plant. That speaks to the 'intimate' in the title. I know it'll encourage me to take a closer look and pay more attention to flowers and plants." joSon's "sensitivity to the natural world," rooted in his years living as a monk, clearly shines through the work, said Cannon, a local garden writer. "He just has an appreciation for what the world offers. It's very refreshing."